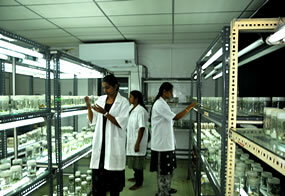 Plant Physiology Division was established in 1980 which has been primarily concentrated on crop productivity. The division strives for excellence in applied research in tea productivity and bush health besides biotechnological studies. The research undertaken extends over a wide range of research programmes having collaborative links with different Universities, National Research Institutes both within the country and overseas. Track record of the division is presented hereunder. Altering the metabolic activities by applying anti-transpirants to induce drought resistance in young and mature teas was given prime consideration besides certain nutrients to alleviate the soil moisture stress. It has been demonstrated that foliar application of urea nitrogen and muriate of potash during dry weather period impart drought tolerance both in young and mature tea without affecting carbon metabolism and dry matter compartmentalization. Besides foliar application of antitranspirants, physiological significance of irrigation/fertigation was documented. Studies on physiology of pruning, recovery of tea plants (quantification of starch/carbohydrate reserves) form the basis of pruning time and height besides resting the bushes prior to pruning. The relationship between bud break after pruning and root carbohydrate reserves has been established.In early nineties, an isotope laboratory was created in the division which has been approved by BARC to use radioactive carbon (C-14) sources and stable isotope, N-15. The said facility has enabled the division to conduct basic studies on photosynthesis and partitioning of assimilates in relation to various agronomic practices such as pruning, plucking, irrigation, shade management and foliar application of plant growth regulators and nutrients. 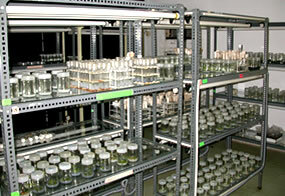 As an integral part, basic studies on applied nature were also undertaken considering the time to time requirements using radiotracer techniques particularly in the field of photosynthesis and assimilates translocation. 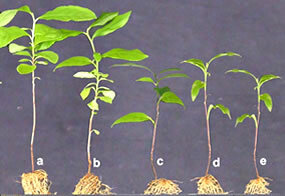 The role and importance of mother leaf and maintenance foliage in providing nutrients to the growing shoots were also identified using this technique. Radio tracer (Zn-65) studies coupled with PGR, naphthalene acetic acid revealed the synergism towards micronutrients where it promotes substantial uptake of foliar applied micronutrients, particularly zinc. Foliar application of PGRs, antitranspirants and micronutrients has lead to a release of schedule to improve the productivity in south Indian tea plantations. Among the tea polyphenols, catechins gained importance in recent years because of their antioxidant potential. In view of importance of catechins, biochemical characterization and influence of environmental, edaphic and agronomic practices in catechin biosynthesis were envisaged. Tea clones were characterized on the basis of catechins and their fractions. According to the principle component analysis, UPASI clones were segregated into five distinct groups. Segregation of these clones was on the basis of ratio between dihydroxylated to trihydroxylated catechins. Substrate specific catechin biosynthesis was confirmed with radio labelled isotopes. 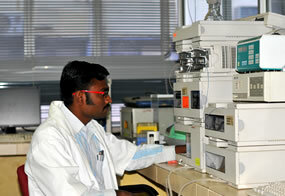 Development of production system for tea polyphenols and their condensed products were also investigated by the division. Factors influencing polyphenol contents, classification based on catechin fractions and screening of polyphenol oxidase were conducted using 306 tea accessions available at UPASI Tea Germplasm. Conventionally, promising traits were selected on the basis of morphological characters and yield potential of a particular accession which needs man power and has prolonged gestation period. Recently, physiological and biochemical markers have been employed in plant improvement programmes. Based on the data generated, a multiple regression model was formulated and validated to predict the productivity of undescribed tea accessions. Similarly, data based on stress related parameters were prepared and correlated individually with yield for screening and selection of productive trait under soil moisture stress. Prediction models were developed to forecast quality attributes of unknown tea accessions on the basis of green leaf quality parameters. Perhaps, these models were validated where about 10% variations is attributed to the tea culture. These equations are being put to use in plant selection programme. Out of 254 mother bushes selected from the estates, 83 were identified as productive plants with good quality and high yielding capacity besides a few accessions performed well during soil moisture stress. Field evaluation of MGL-35 (productive & quality), MGL-5 (quality), MGL-20 (quality) and MGL-18 (productive) is in progress. 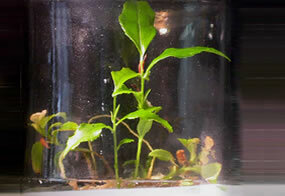 At present eco-physiological studies and carbon sequestration in tea ecosystem gained momentum in the laboratory. Survey and analysis of secondary data indicated the changing scenario of climate on productivity besides other variables. Carbon sequestration studies in tea picked up its rapid phase to document the baseline data with reference to clean development mechanism (CDM). The division conducted a number of field experiments to enhance the yield by foliar application of plant growth regulators (PGRs) and other adjuvants. The division has evaluated more than 60 commercial formulations including naturally occurring growth substances like triacontanol, gibberellic acid and bio-origin protein hydrolysates, amino acids and micronised K ion rich bioactive amino acids. Field studies demonstrated that specific concentration of PGRs improved the crop synchronizing with reduction in dormant shoots in the harvest and without affecting the cup quality. In mid-eighties, in plant physiology division concurrent research on plant biotechnology was initiated; to remark this event a tissue culture laboratory was set up as a stepping stone to the innovative biotechnological research. Initially, rapid multiplication of tea and shade tree protocols were developed. Under the auspices of DBT funded project, “Improvement of tea through biotechnological tools” complete characterization of existing clones using physiological, biochemical and molecular tools and in vitro propagation and field establishment of superior clones had been studied. So far, tea accessions available at tea germplasm collections were used for characterization. 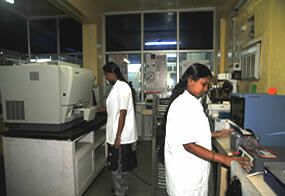 Generated data were documented as per the requirement of National Bureau of Plant Genetics Resources (NBPGR), New Delhi. Molecular characterization has been initiated using RAPD and ISSR for the development of molecular markers for desired traits and to assess the genetic diversity among the south Indian germplasm. In vitro derived tea plants were planted in the field and evaluated for their field performance under south Indian conditions. 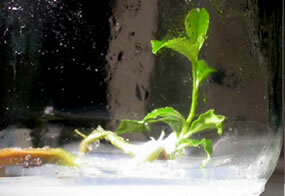 Further, field performance of tissue culture (TC) raised plants were compared with conventionally propagated (VP) plants. There were no variations in terms of morphometric, physiological, biochemical and genetic characters between VP and TC plants. As a part of in vitro breeding and in order to induce genetic variation within the existing tea germplasm, studies on somatic embryogenisis were initiated. Somatic embryoids were induced from the cotyledonary cultures either directly or indirectly via callus. On germination of embryoids, plantlets were hardened and field tested; about 44% variation was observed among the somaclonal derived plants in terms of physiological and biochemical attributes. At present three variants were selected on the basis of quality and productivity traits besides distinct morphological characteristics and propagated for large scale field experiment. Banji (Dormant shoot) formation hampers productivity of tea fields and quality of made tea. Endogenous growth promoter (gibberellins): inhibitor (abscisic acid) ratio has been identified to play a significant role in deciding the fate of the growing shoot. Various PGRs are being evaluated for banji shoot management where folier application of gibberellic acid and KNO3 is found to reduce the proportion of banji shoots in the harvest. To identify the genes responsible for banji shoot formation, expressed sequence tags (ESTs) analysis from cDNA and SSH libraries was adopted. Database pertaining to cDNA and SSH libraries were submitted to National Centre for Biotechnological Information (NCBI). Expressed sequence tags (ESTs) were generated and analyzed from cDNA library during dormant shoot formation in tea and related sequences were submitted to GenBank. Putative function analysis of ESTs and gene expression profiling were also documented. Transformation studies were initiated with a marker gene, green fluorescent protein and transformation/expression was confirmed with polymerase chin reation (PCR) and southern blot analyses. In order to impart biotic and abiotic stress resistance in tea, efforts are made in introducing osmotin gene in callus cultures. As a mandate of CSIR-NMITLI sponsored multi-institutional project entitled, “Using functional genomics in plants: niche pathway engineering in tea”, two gene constructs, F3H and ANR involved in catechin biosynthesis pathway were attempted in transformation studies. Their over expression is expected to improve the catechin content which in turn improves the quality of processed tea. The genetic diversity of south Indian tea germplasm has been assessed using AFLP marker. Finger printing of 1763 tea accessions (collected from all over India) has been completed. AFLP profiling has classified the Indian tea accessions to their respective genetic origin and forms the back bone for further breeding of elite and diverse cultivars. Even though the existing germplasm showed wide variation, randomly amplified polymorphic DNA (RAPD) and amplified fragment length polymorphism (AFLP) analyses of south Indian tea showed a narrow diversity among the commonly cultivated tea clones. As a prime objective of the DBT sponsored project, ALFP analysis of available Indian germplasm were carried out and morphological characteristics of the tea accessions were also documented. Molecular linkage map of tea genome for novel gene identification, production of genomic library and secondary metabolite production are the other studies underway in the division. A collaborative project between Plant Physiology and Pathology Divisions on “Biotechnological and biocontrol studies on tea blister blight pathogen” was concluded where the biochemical aspects of blister resistance/susceptibility was investigated besides the biotechnological approach. Phylogenetic relation of UPASI clones on the basis of RAPD markers related with blister blight resistant/susceptibility was established and cDNA library construction with blister resistant tea accession was completed and resultant cDNA sequences were submitted to GenBank. Certain classes of proteins called pathogenesis related (PR) proteins are induced in response to the infection of plants with pathogen. An attempt has been carried out to identify PR proteins responsible for blister blight infection. The specific PR protein formed will be isolated and sequenced. The study will help in identifying the gene related to blister blight resistance. For early identification of blister bight resistance or susceptibility, SCAR marker has been developed. This DNA marker will enable to selecting blister blight resistant/susceptible plants. Development of drought specific micro satellite markers (SSR) is also being investigated. Under the auspices of Tea Board XI plan project, “Analysis of gene expression during phytopathogenic stress in tea using transcriptomic approach” is underway. Studies on gene expression during pathogenic stress in relation to grey blight and blister blight were initiated and a number of cDNA constructions were sequenced and submitted to National Centre for Biotechnological Information (NCBI) public database. Ontological analysis of genes obtained from grey blight specific cDNA library was carried out besides biochemical characterization and analysis of PR proteins. Lectins as an alternative biotic stress management system in tea was initiated very recently and isolation of lectins from edible sources are in progress. Isolated lectins were purified with chromatographic techniques. 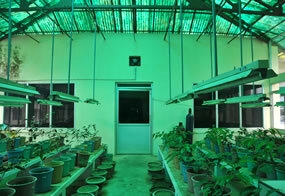 Laboratory studies are being conducted to document the bioefficacy of purified lectins against red spider mites.